There was no siren this time — sirens are what often sets off coyote howling in the city, where they usually begin in tandem or pretty close together. 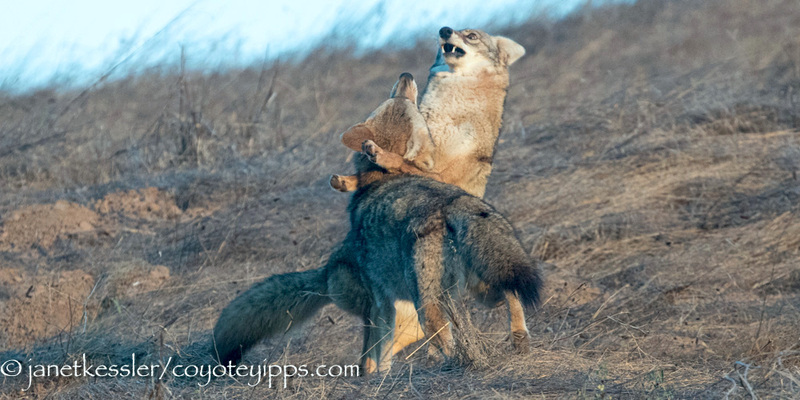 This howling reflects their unity as a family, and possibly territorial separateness from any neighboring coyotes. For more about oral communication, see my post on Voicings. But this time, it was SHE who vocalized alone: she was calling out to him repeatedly. Rather than answering in-kind and right-off, he apparently responded by actually coming. Then, once she was in his line-of-vision, he began his high-pitched, pup-like locutions, and then her calls morphed into the same type of little “hello there” whines and squeals. These are greetings. 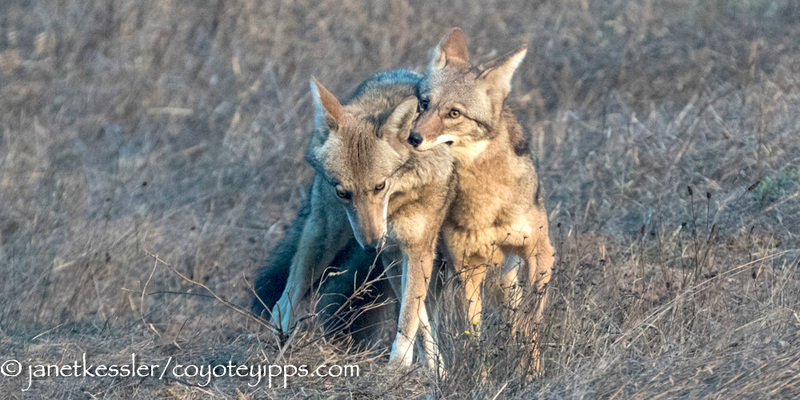 These two coyotes are an old, mated pair. 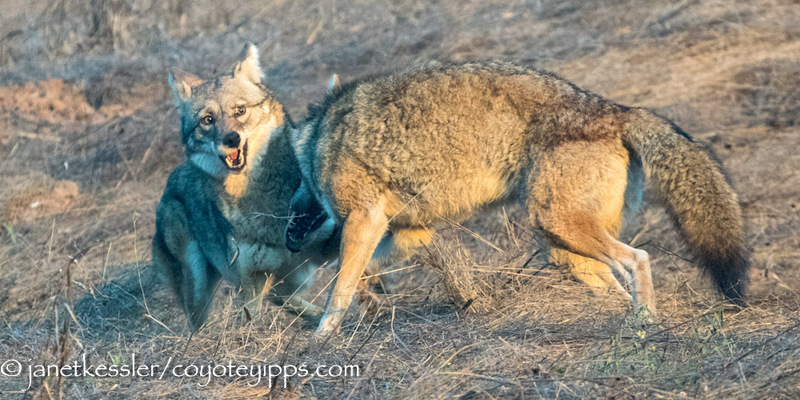 Their evening rendezvous, which this is, although joyous in its own way, was more a confirmation of each coyote’s status towards each other. The male is the dominant fellow in many ways, and you can see this when they finally come together: she crouches down and lets him stand over her: it’s their little ritual. But note that she is the one who did the calling. A more “conversational” back-and-forth communication over the distance can be heard here. After the meeting/greeting they both went off hunting separately, but sticking close by to each other. 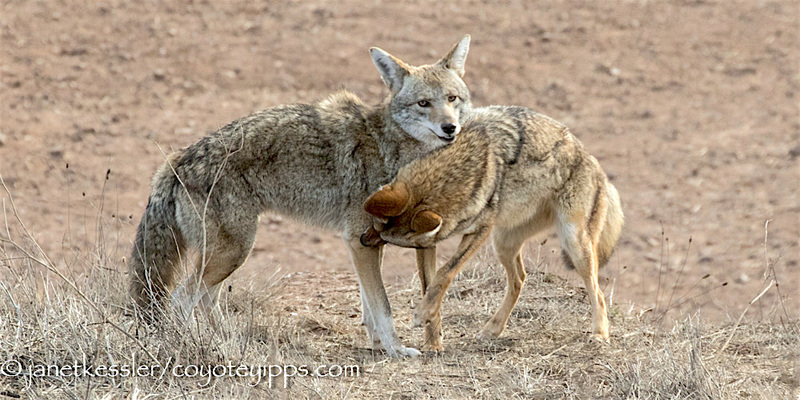 Coyotes are social and enjoy each others’ company. The injured coyote I wrote about in my last posting is doing great even though he does not have full use of his foot yet! He’s walking, running, and kicking up his heels for the fun of it, having a fantastic time with his mate. But it might not have been this way. Apparently people on NextDoor had contacted a wildlife rehabilitator to actually trap this coyote — I was asked to participate by monitoring the trap. This “plan” came about based solely on visual reports, by well-meaning folks on that forum, that a coyote was injured — subject and situation unseen by the trapper who also didn’t know much about coyotes. I was not too happy about this because it was obvious to me that this was a step which should not be taken. It was almost four weeks after the injury and the animal was improving well on his own. I explained the situation to them: That this coyote was healing beautifully, was able to run well on three legs, hunted wonderfully and could take care of himself. That he just needed to be left alone: the animal was very mobile and interference was not necessary. That the best thing that could be done for him was to give him space and to keep dogs from chasing him, because this was probably what caused the injury in the first place. The WORST thing in this case would be to “rescue” him — it was a short-sighted plan that neglected to look at the whole picture. This coyote is part of a very happy newly formed family unit, and trapping would absolutely disrupt what he had going for him. Coyotes are resilient and live beautifully in the wild even with huge handicaps. I sent videos to show the improvement over that last month. The day after the injury. Three weeks after the injury. And now, please take a look at the video above, six weeks after the injury. When the coyote first showed up with a hefty limp, it appeared that the foot might be dislocated or broken. He could not use the leg at all and held it up. But within a day he had learned to run on three legs and continued to hunt well, so I didn’t want to interfere (see addendum below). Nonetheless, to cover all bases, I sent photos and videos to a veterinarian and I contacted Lou, my rancher friend who has had an intimate association with countless wild coyotes for 30 years. The veterinarian responded, saying that indeed the foot looked either dislocated or broken in some way, which potentially could lead to problems in the long run. She said that there was no really good way to address this in a wild animal other than complete capture and wildlife vet intervention to surgically fuse his ankle. And then likely a wildlife sanctuary life for him. Otherwise, she said, we let nature take its course: allow the foot to self-fuse (self-arthrodesis). Once it is “fused” more weight will be placed on it, but this process can take months. The veterinarian agreed that the best option was to allow the coyote to heal on his own. I concur with leaving the injured coyote. 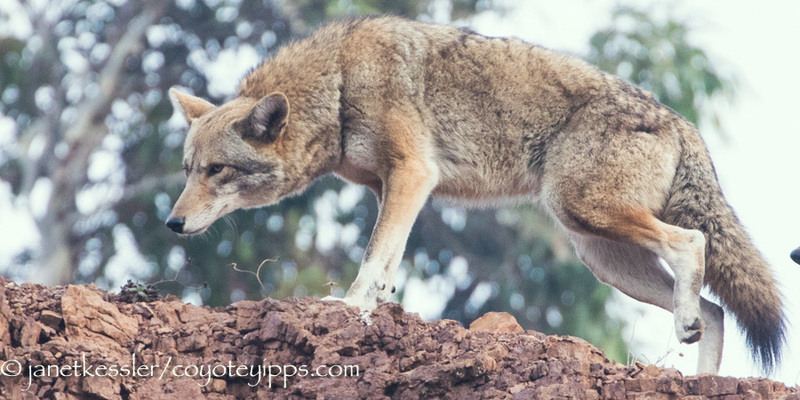 A coyote is a finely tuned canine and capture along with captivity, then release surely changes them and likely not for better. 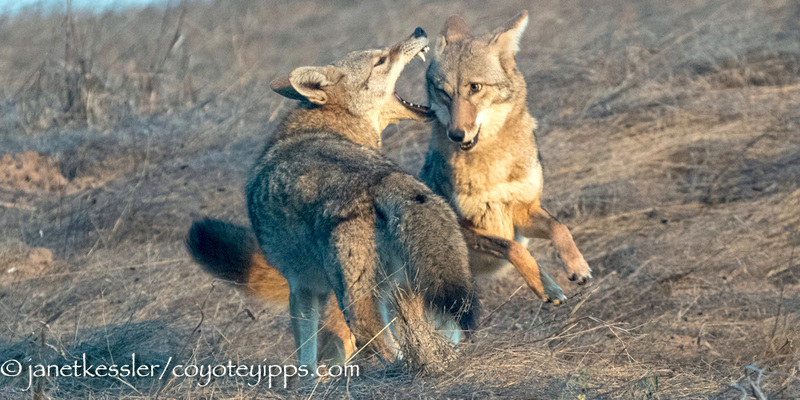 Also, most people cannot comprehend how tough canines are, especially wild coyote. 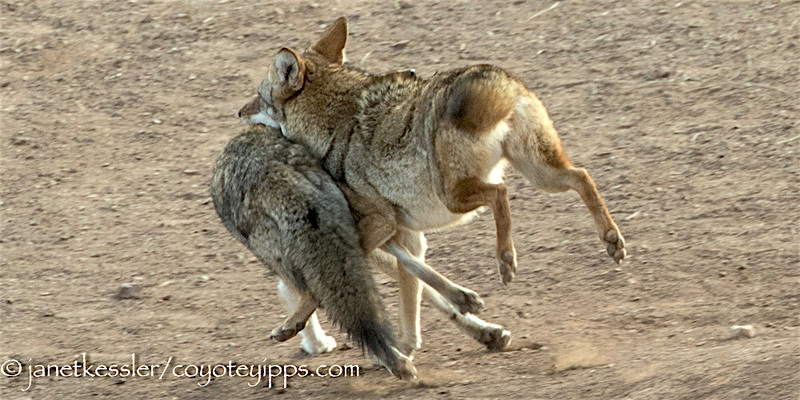 Many a coyote has lived long and well with serious, permanent injury or debilitating condition. If a coyote had a choice, he would rather heal slowly or partially in wild then quick in captivity. Wounded but still wild and healing is how the coyote has developed into such a super canine. They have learned to survive and thrive in a dangerous, painful at times, world. 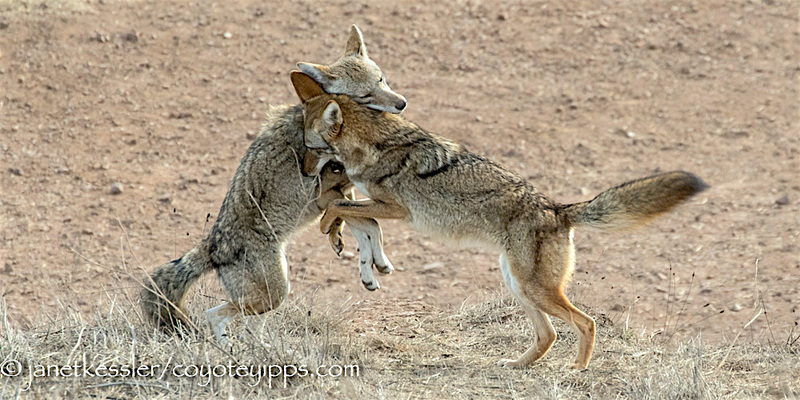 One of the local coyotes is instantly recognized by his permanent limp, and scarred body. He is unusally banged up and old yet has been a dad and leader for years. A bum leg or foot hasn’t stopped him in the very least. Although the coyote may not recover to exactly how he was before the injury, I’m told he’ll recover enough to lead as full a life as ever. Capture and confinement, which is what medical aid would entail, would unnecessarily terrorize the coyote and alter his “wildness” forever. We don’t need to do this. 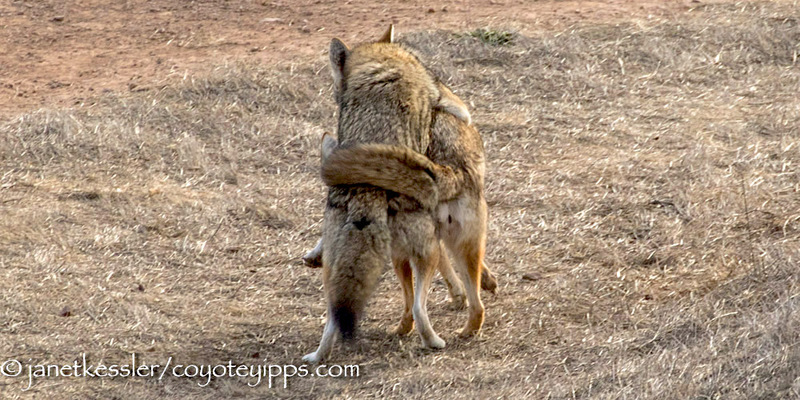 And most importantly, the possibility of life in a sanctuary is not an acceptable option for this coyote who is happy with his newfound mate right where he is. There are always tradeoffs, and this time the scales were in favor of leaving the animal in his fantastic social situation to heal on his own over an immediate but disruptive and traumatizing “fix”. Addendum: Ten years ago I looked on and watched another coyote heal from a much worse upper leg and hip injury — most likely a break. The leg was dragged for months on end. I could see that she was able to take care of herself, so I decided to watch her instead of opting for an immediate fix requiring removal. I’m glad I did, because unbeknownst to anyone, it turned out that she was a single mom with two pups (well hidden, obviously) who would have perished had she been interfered with. Anyway, this taught me that we humans can’t possibly know all contingencies. IF nature CAN heal a wound/injury, I learned, it should be allowed to do so. 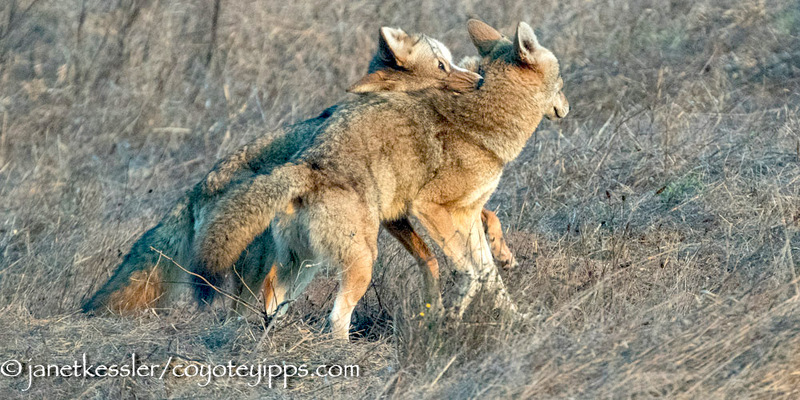 Grooming is a major social activity for coyotes. It is part and parcel of companionships, friendships and pair-bonding, as well as family-ties. Grooming also has health benefits: for example, it reduces ticks which often act as vectors for spreading disease and infection. It also, apparently, is a calming factor in many animals. 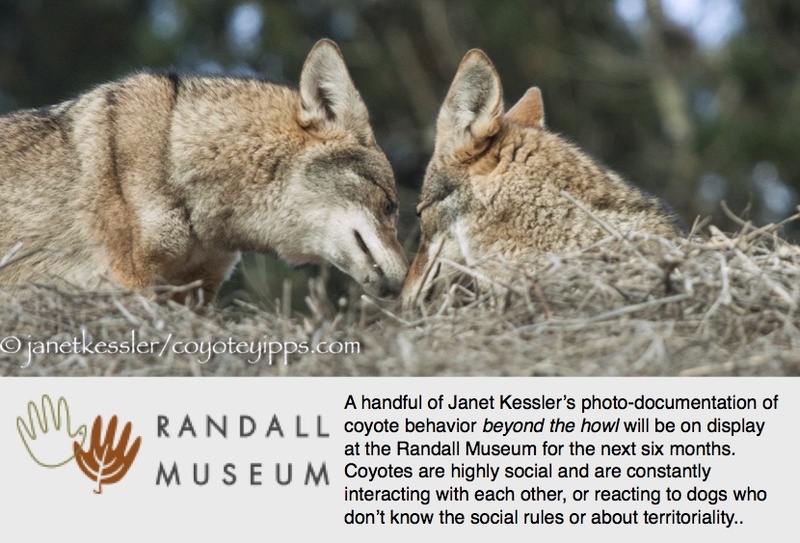 I’ve shared with you how one ranch I visit has had a no hunting coyote policy for many years. This recently developed into a discovery on the ranch’s property. The owner and patriarch of this ranch was born here. He knows literally every inch, tree, range and spot of this vast property. He knows the sounds and smells. Only very old age limits his patrols and work. He has children and grandchildren who also help, as well as hired hands. So it’s well cared for. I went for my monthly visit and patrol of some distant fencelines when he mentioned he hasn’t heard the coyotes for 2 weeks and felt something was wrong or going on along one area and border. He knows nature. He said this is “especially the noisy time of year for the pack, and if they aren’t hollerin, somethin’s up”. He asked for me to be especially watchful in one area, and I’m glad he did. I approached the spot, and my dogs alerted in every way. They casted and scented, circled, growled, and looked all over. Eventually, I found the cause. It was a poachers camp, with illegally killed deer, elk and bear meat and parts being processed. They camped literally just inside his ranch, hidden in gully that joins BLM land and forests. There also was a “dump” where scraps were tossed. I discreetly took pics and hurried back to inform rancher and make calls to authorities. I must admit I was pretty enraged. And we had to almost hold the old rancher from literally saddling up with his favorite horse and guns. 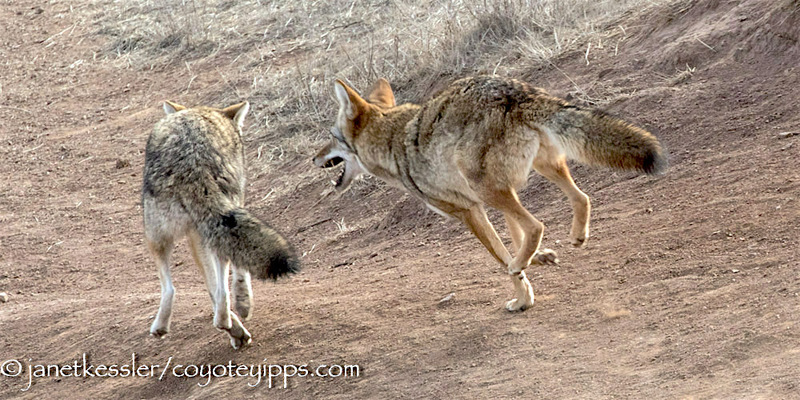 What we determined was a group of poachers were there and by their actions disrupted the coyotes. They were moving and hunting at night, not moving like ranchers and workers. 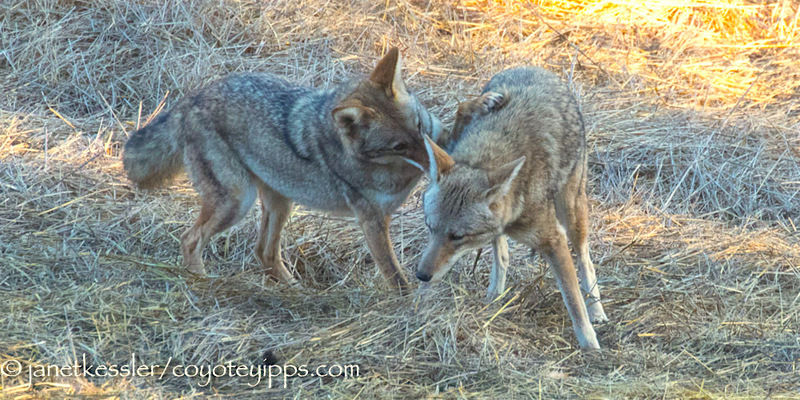 Also, the coyotes were scavenging the poachers dump but were silent due to being cautious of new humans, and or being stuffed unusually every day. And who knows, perhaps poachers tried to hunt them too. Either way, the suspicions of the rancher were raised because his normally vocal coyote neighbors suddenly went silent for a long time. That is really tied to the land. He says he won’t feel better until he hears ‘his’ coyotes again. Another reason to let coyotes remain. They can tell us alot…if we listen.